I think most cyclists who spend much time out in the world have the experience of getting yelled at by passing cars from time to time. A lot of the time it's unintelligible and these days I always just smile and wave. Saturday I was riding down to Regina's Candies to get some Easter loot, a common springtime ride for me, and went down Lexington through Como Park. I was using the bicycle/pedestrian sidepath and clattered across the intersection where a couple of cars were waiting. 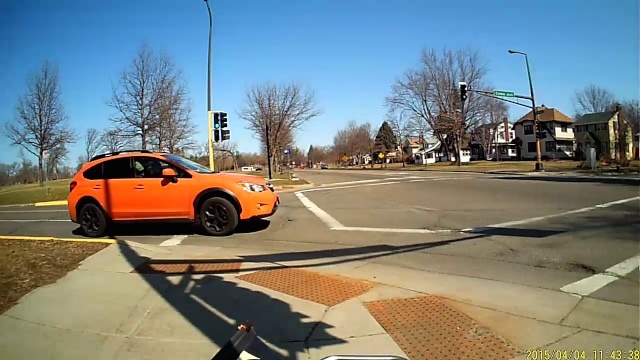 The guy in the orange car came around the corner and yelled "Nice Stop!" as he accelerated past, showing his aggravation. You can pretty clearly see that I've got the green light. Not quite discernible in here is that I also have the pedestrian Walk signal. I had to swerve around Orange Car guy because his extensive driver training apparently omitted the part about where you're supposed to stop for a traffic control device. It's not uncommon to get yelled at for doing perfectly legal things, like, you know, riding in the street, but I particularly liked getting chastised by someone because I didn't stop when I have the green light! I expect there'll be more morons this season, but the first sighting is always a welcome sign of spring. Happy Riding everyone! And remember to stop at all those green lights! I like your response. Smile and wave. Either makes them mad or just confuses them more. A win regardless!